These provocative statements open John Gray’s newest book, Seven Types of Atheism. Gray is a former academic (Oxford, London School of Economics) who now writes full time.The title of his tome is a nod to literary critic and poet William Empson, whose Seven Types of Ambiguity (1930), he says, “showed how language can be open-ended without being misleading.” In a similar vein, Gray attempts to show that atheism can take different forms, many of which are not that different from religions. In attempting to pigeonhole atheists into seven groups, he self-admittedly fails, as crossovers due to ambiguity are inevitable. Nevertheless, he successfully takes the reader deeply into the thinking of atheist (and religious) philosophers through the ages, many of whom you may never have heard of. Though claiming he has “no interest in converting anyone to or from any of these types of atheism,” he is not shy about offering his own biases throughout this short volume (158 pages). 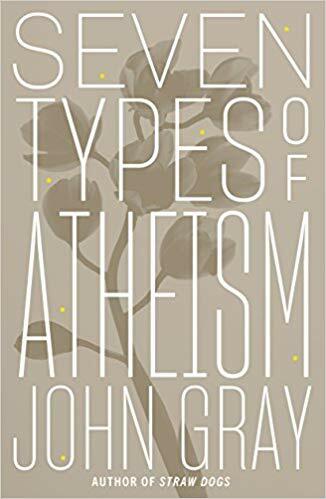 Though Gray has strong opinions about “contemporary” atheism, he spends very little space discussing our current atheist thinkers. This is very evident in his first two chapters. In the first chapter, ”The New Atheism” (the shortest at 15 pages), he accuses proponents of “directing their campaign against a narrow segment of religion.” “Hence the ‘God debate’ – a tedious re-run of a Victorian squabble between science and religion …… a relic of the nineteenth-century philosophy of Positivism.” (The latter was developed by Henri de Saint-Simon in the early 19th century and promoted by his disciple Auguste Comte.) The bulk of the chapter is devoted to the discussion of “Why Science Cannot Dispel Religion” and why the real issue is the monotheism of Christianity. The only two “new atheists” he refers to are Richard Dawkins and Sam Harris. He takes Dawkins to task for having “embellished Darwinism with the cod-science of memes – units of information that compete for survival in a process of natural selection (akin to) that which operates on genes.” He accuses Harris of wanting a “science of good and evil” that “he assumes … will support liberal values of human equality and personal autonomy.” Gray likens this to the illiberal illusion of “scientific ethics” claimed by Nazi Germany or Russian Communism. Chapter 2, “Secular Humanism – a Sacred Relic,” is likely closer to most Humanists’ hearts. However, Gray follows the historical academic definition of “secular humanism”—that is, a religion that worships humanity rather than a god, that has replaced supernatural gods with humanity, humans, or their aspirations. I could go on and discuss the remaining chapters on the five other types of atheism (Scientific Atheism, Political Atheist Religions, Atheism of God-Haters, Atheism without Progress, and finally, Mystical Atheism), but I will leave that for the reader to explore. Suffice to say that in the process of propping up straw men and knocking them down, he is nevertheless interesting, erudite, and considering the seriousness of the topic, even sometimes amusing. He is an excellent storyteller and the details and background he gives for the various examples he uses to make his arguments are worth the price of the book. Gray himself is clearly in the Atheism without Progress camp. He is, in many ways, the Anti-Pinker in his outlook on humanity; it is not clear that he ever has even read Steven Pinker or Michael Shermer or any of the other recent atheists who have documented human moral and ethical progress. (See this review of Steven Pinker’s Enlightenment Now by HofMN’s Mick Anderson.) He would say such progress is temporary and illusionary. I would not necessarily recommend this book to everyone. It can be depressing and Gray is a convincing writer. However, if you want an alternate view of history and atheism, you will find this work to your liking. Caveat Lector!